For greater oversight and medium-term planning, Anglo American identified a need for a software package that would allow them to effectively design and schedule the mine operation in the one software package. Deswik worked with Anglo American to provide the solution. 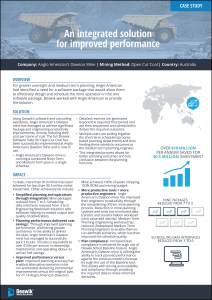 With Deswik’s assistance, Anglo American’s Dawson mine managed to achieve significant haulage and engineering productivity improvements, directly reducing their cost per tonne of coal. The full Deswik Software Suite for Open Cut Coal has been successfully implemented at Anglo American’s Dawson mine and is now in use. To date, over 10 million dollars are being saved each year for an initial investment of $0.5 million.